If you didn't have much to do this afternoon and tuned into the much-pumped Oracle cloud announcement, you probably were left scratching your head about an hour and a half later if you stuck around (as El Reg is paid to do), wondering what, exactly, Oracle announced and why it took so long to do it. Oracle did not "round out" its cloud offerings, as many had been expecting, but rather company co-founder and CEO Larry Ellison did walk through the Oracle Cloud in a little more detail than he did back during the OpenWorld extravaganza last October. And he cut a lot of jokes and even did another demo, this one on the social marketing aspects of the Fusion apps running on the Oracle Cloud, Big Red's implementation a platform and application cloud for running its own code. But the news was a little light. It could be – and at press time Oracle PR could not yet confirm this – that what Ellison was trying to communicate between all the jokes and demos was that the Oracle Cloud was out of testing phase and now generally available. As the shindig got going, Oracle flashed up some data saying that over 10,000 customers and over 25 million users were hammering away on the Oracle Cloud, which is a pretty good ramp if these numbers are correct. Oracle has been selling software-as-a-service to customers for many years – long before Amazon launched its EC2 compute cloud, in fact – and that number almost certainly has to include those customers as well as anyone who has signed up since last October for the Oracle Cloud to run Fusion apps or Java runtime or Oracle database services. Which is all that the Oracle Cloud – it is apparently no longer called the Oracle Public Cloud – currently does. There's absolutely nothing strange about Oracle using its own iron to build its own public cloud, complete with virtualization to make it all modern and secure, to run its own software on behalf of customers and to distinguish it from plain-old application hosting. In fact, launch a public cloud, with monthly per-user fees for access to Fusion applications and other services makes perfect sense. It is a pity then that Oracle has not yet provided detailed pricing and configuration information for the Oracle Cloud, which is what this presentation should have been about at the very least if it is indeed generally available. Ellison started out his presentation by reminding everyone how rare it is for a company to survive jarring transitions. "Very few technology companies cross the chasm from one technology to the next," he said, explaining that you have to see the change coming and invest in the future technology as well as keeping the current technology advancing enough to keep customers paying. And this is what Oracle has done, both through more than six years of development on the Java-based Fusion apps and its acquisitions of Taleo talent management and RightNow for customer experience management. Ellison said that there were now more than 100 modules in the Fusion stack running on the Oracle cloud, but this is not exactly true. While there are financial management, human capital management, supply chain management, project portfolio management, procurement, customer relationship management, and governance modules as well as the Oracle Social Network extensions that allow for collaboration and link the apps to the Facebook, Google+, and Twitter, if you actually go to the Oracle Cloud, the Fusion HCM and CRM modules and the Social Network extensions are live, as is the Oracle database service and the Oracle Java service. And thus far Oracle has not explained where the core manufacturing, distribution, and retail modules for the Fusion stack are and when they might be coming to the cloud. Still, Ellison is quite proud of the fact that the Fusion apps are rolling out, and says that it was a "gigantic effort" and that the work that Oracle has done to standardize its applications on Java and get them cloud-enabled, with an HTML5 interface, is "a huge barrier to entry." "I do not know how you start now," Ellison said, referring to arch-rival in the ERP space, SAP, which he said would not have its cloud-enabled ERP software ready until 2020. "20/20, excellent vision. 20/20, a great news program. 2020, a terrible time to get to the cloud," Ellison quipped. "All that SAP's got is SuccessFactors." SAP certainly has had its woes trying to make cloudy ERP apps, and it did shell out $3.4bn in cash to buy cloudy HRM software provider SuccessFactors last December to try to up its cloud game some. 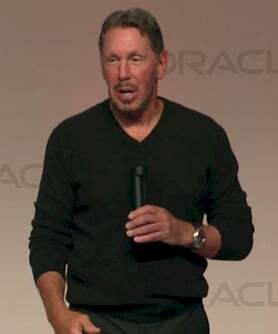 As for Workday, the cloudy HRM provider that was founded by Dave Duffield, the founder of PeopleSoft (now part of Oracle), Ellison was much amused by the company's decision to use a Flash-based user interface and an object store instead of a relational database as the backend. 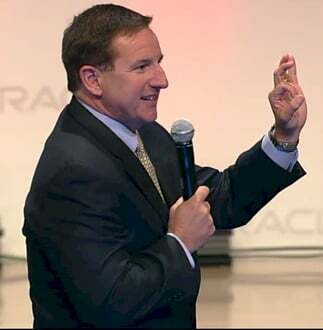 He quipped that even rival Salesforce.com uses a relational database (it is a very large Oracle customer, although Ellison has said in the past that he thinks Salesforce.com is using Oracle 11g incorrectly by having multiple customers share a single database). "They have made some fundamental architectural decisions that are flat wrong, and I think calamitous," Ellison said of Workday. "We'll see." There was some actual news at the Oracle event if you stuck around long enough. First, Oracle is not going to be doing a lot of upgrading on its cloud, as many providers do on a seemingly continuous basis. Oracle cannot easily afford to support releases of its software forever on the Oracle Cloud, but it can't push companies to upgrade like SaaS suppliers like Salesforce.com can, either. And so Oracle intends to support the current version and then the prior version on the Oracle Cloud at any given time, and allow customers up to a year to upgrade to the current release. "You decide when you want to move to the next version of the software. We don't decide for you." The third chunk of news is that Oracle is unveiling a platinum services level, which is available on Exadata, Exalogic, and Sparc SuperCluster engineered systems and on the Oracle Cloud. This platinum level of services requires customers to put agents on their machines and a gateway server that collects information from the machines and beams it back to Oracle's support center. This data is used to do 24x7 proactive management on the systems, and the platinum service also includes quarterly patching of the systems done by Oracle techs remotely and on a time schedule of the customer's choosing. Oracle is guaranteeing 5 minute issue response, 15 minute service restoration or escalation to the Oracle product development team, and 30 minutes until a joint debugging session is set up if the problem is not resolved. Oracle said from the day it bought Sun Microsystems that the game for engineered systems was about providing better customers support that would make the premium it charges for these systems worth it. And to Oracle's credit, these premium services are being offered for free to customers who already pay for enterprise support on those three types of systems and as well as on the Oracle Cloud.